New survey shows a third of British citizens believe PM May should retain her position, while half believe she should step down. 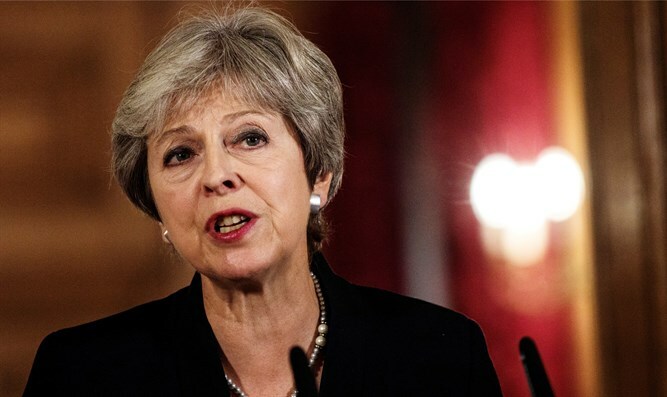 A Wednesday survey showed that half the British public believes British Prime Minister Theresa May should step down, Politico reported. The Politico survey included 500 adults and follows May's second failed attempt to pass a Brexit deal. It showed that 32% of the British public believes May should continue in her position, while 50% believe she should resign immediately. A full 42% believe elections should be moved up, with 38% opposing the move. Most of those who would like early elections oppose Brexit. May has emphasized that she does not intend to resign. A full 47% of British citizens oppose moving forward without an agreement while 35% support leaving without an agreement, and 44% support extending the negotiations with Europe. Thirty-eight percent of respondents support remaining in the EU. In addition, the survey showed growing support for both remaining in the European Union and holding a second referendum. On Thursday, the Parliament will vote on whether to request an extension for the negotiations.